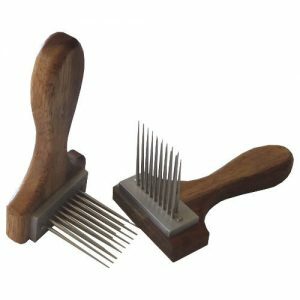 This set includes a wooden comb holder, 2 handles, diz, diz threader and 2 x G clamps, and a fine 4 row headset. This set includes a wooden comb holder, 2 handles, diz, diz threader, 2 x G clamps and 2 fine 4 row headsets. 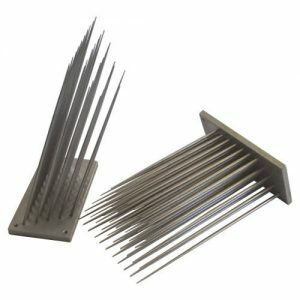 This set of combs with the fine headsets are designed for the majority of fleeces we have available to us in Australia including alpaca and merino. The extra row of tines assists with the finer fleeces and makes the combing of these fleeces more efficient. The headsets are aluminium and the tines are precision machined from stainless steel. The first row has 15 x 2.2mm tines set 3.6mm apart and the working area is 9.5 cm wide and 14.5 cm high. Optional interchangeable headsets are available in standard 3, 4 and 5 row, fine 3.